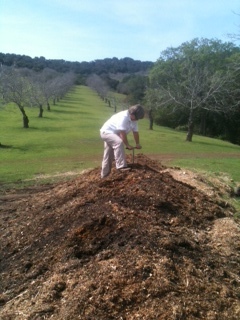 May be this is the year you have decided to be more “green” and you are wondering how does one start a compost pile? I always felt that the best answer to that question is: just start a pile! Okay may be a few helpful suggestions 1st: Choose a convenient site; keep the compost pile close to your garden, in a shady location. This will encourage you to regularly add to the pile and observe its progress. If you only compost garden wastes, piles don’t need to be enclosed. But if you plan to also add Kitchen wastes to it, you need to plan on a sturdy enclosure, home made or purchased, to prevent animals from digging, trying to find that delicious piece of rotten lettuce. Work with what your have in your yard, farm and kitchen. Shred and cut materials into small pieces for faster composting, reuse and recycle your newspaper and card board (presoaking in water helps breakdown). Now to the part that seems to baffle many folks tending to their compost pile: the C/N ratio of the pile. Why should you even care? You care because the ratio determines how fast the pile breaks down into useable compost. It does not need to be complicated! Some fast facts: a C/N ratio of 20/1 or even 40/1 will heat your pile quickly and keeping it moist and turning it twice (groan) produces perfect compost in 4-6 weeks. The opposite would be a 200/1 ratio, this pile will sit through the winter, still being only partially decomposed by next spring. We call this a cold pile. Cold indeed. How do you get that 20/1 or 40/1 ratio? By using the following method: Alternate as you are building your pile with layers of thin, high C or brown materials ex: wetted card board or newspaper; with layers of thick (as in 3-10 times thickness compared to the C part of the pile) of high N materials ex: weeds, yard waste. Always go through the extra step to moisten the layers, if you are in a drought stricken state, use grey water. Some examples of materials and their C/N ratio: kitchen waste:15/1 horse manure: 30/1, pulled weeds: 30/1, leaves: 55/1, sawdust: 440/1, cardboard: 500/1. I like to pile high at least 4 feet, so that the pile heats up fast, to a temperature that will kill weed seeds, 90-140 degree will do the job. This generally only takes a few days if the pile is build well and is kept moist. Because I live in CA and we are in our 3rd year of drought I have been building my piles in the late winter and early spring, relying only on rain water. By the time the weather turns hot, the piles are done and what I don’t use gets covered up to retain internal moisture. In the photo you see me checking on one of the piles in the Walnut orchard. Using horse manure and grape skins the pile is recycling materials from our two Farms. It is done been build up I am now inserting Biodynamic Preparations which will further help the microbes in breaking down materials to produce rich smelling, soil like material. Happy Composting!